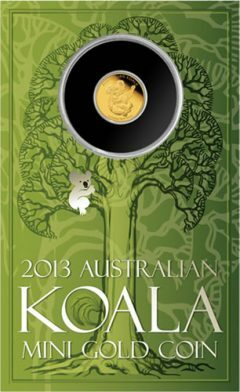 A button-sized 2013 Australian Mini Koala Gold Coin is now available as the first Mini Koala to be issued by the Perth Mint of Australia. This coin is struck from one-half gram of 99.99% pure gold and features the likeness of a koala on its reverse. "Extremely affordable, the delightful Mini Koala offers collectors the chance to expand their collection with pure gold," describes a statement from the Perth Mint. "This coin is a precious collectible or gift that will stand the test of time." Half gram gold coins are not a new concept for the Perth Mint. Strikes referred to as Mini Roo Gold Coins depicting kangaroos made their debut in 2010 and have appeared annually ever since. The most recent version, the 2013 Mini Roo, was released in April. Owing to their desirable depictions of one of Australia’s iconic creatures and their affordable price points, Mini Roo coins have become a popular annual offering. This new release is likely to garner interest as well for the same reasons. The koala design is the work of artist Tom Vaughan. It shows an adult koala perched on the branch of a eucalyptus tree branch. Around it are inscriptions of AUSTRALIAN KOALA, 0.5 GRAM 9999 GOLD and the Perth Mint’s mint mark of ‘P’. Each gold coin is struck as legal tender of Australia under the Australian Currency Act of 1965. As legal tender, the obverse depicts the Ian Rank-Broadley effigy of Queen Elizabeth II. Obverse inscriptions include ELIZABETH II, AUSTRALIA, 2013 and the face value of 2 DOLLARS. The minimum gross weight for each coin is 0.5 grams, equating to a gold content of 0.016 troy ounces. The diameter of the strike is 11.60 mm with a thickness of 0.70 mm. Customer demand will determine the final mintage. The Perth Mint houses each one in a protective capsule and presents it in a colorful wallet-sized card. The 2013 Australian Mini Koala 0.5g Gold Coin may be ordered directly from the Perth Mint at www.perthmint.com.au. Pricing is AUS $54.09, US $49.45, but is subject to change based on market conditions. Half gram of gold? it isn’t even worth the trouble of striking. Look at the dimensions. It would get lost or blow away in a slight breeze. The display card would help you find it, with twenty five times more weight in cardboard than gold.